Editor’s note: In this installment of EhOR, Jay Kumar takes a look at the oh-so-’80s AOR of Toronto’s Honeymoon Suite. If ever there was an act that seemed perfectly suited for ’80s AOR, it was Honeymoon Suite. Formed in 1981 in Niagara Falls, Ontario, the band delivered a potent combination of big hooks, big riffs and big hair. The original lineup was led by singer-guitarist Johnny Dee and included Brad Bent on vocals and keyboards and drummer Mike Lengyell. After a few years with a rotating lineup, Dee teamed in 1983 with lead guitarist Derry Grehan and drummer Dave Betts to record the song “New Girl Now,” which helped them win an unsigned band contest held by Toronto radio station Q107. Keyboardist Ray Coburn was added and bassist Gary Lalonde joined the band after recording was finished on the first album (session player Brian Brackstone played on the record). Honeymoon Suite toured constantly in 1983 and 1984, opening for a diverse selection of headliners including Billy Idol, April Wine, Laura Branigan, Jethro Tull, the Kinks and Bryan Adams. The band wasted no time getting back in the studio to record their follow-up album, 1986’s The Big Prize, with producer Bruce Fairbairn (Adams, Loverboy, Bon Jovi). The Coburn-penned “Feel It Again” cracked the top 40 in the U.S., hitting #36, and “What Does It Take” charted at #52 and was featured in the John Cusack teen flick One Crazy Summer. The songs took on a radio-friendly synth-pop direction that certainly reflected the era. Three years later, “Bad Attitude” showed up in the series finale of Miami Vice. Meanwhile, the band opened for Heart, .38 Special, Journey, ZZ Top, Starship and Saga. Keyboardist Coburn quit the band after the tour ended and was replaced by Rob Preuss (formerly of the Spoons). 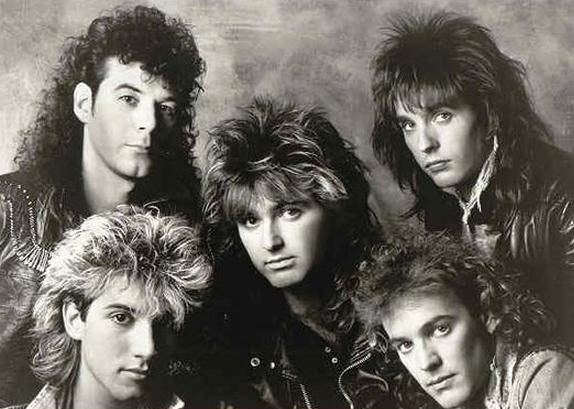 Between their second and third albums, Honeymoon Suite also recorded songs for movie soundtracks, including the Charlie Sheen movie The Wraith (“Those Were the Days”) and the title track of Mel Gibson’s megahit Lethal Weapon. In the winter of 1987, the band was in Los Angeles working on its third album with legendary producer Ted Templeman (Van Halen, Doobie Brothers) when Dee was struck by a car at LAX airport, breaking his leg and sending him to the hospital. Former Doobie frontman Michael McDonald was enlisted to help complete the album. The resultant record, Racing After Midnight, came out in 1988 and did well in Canada but garnered little interest Stateside. “Love Changes Everything” and “Looking Out for Number One” were well-received in the band’s homeland. The following year saw the band release a compilation called The Singles, which scored hits in the Great White North with “Still Loving You” and Long Way.” Coburn returned for a tour, which ended up being the last featuring the band’s “classic” lineup until 2007. As for many hard rock acts that thrived in the ’80s, Honeymoon Suite had a tough time of things in the ’90s. In 1991, the band replaced its rhythm section and released Monsters Under the Bed, which was marginally successful in Canada and essentially unheard in the U.S. “Say You Don’t Know Me” and “The Road” were minor hits north of the border. The rest of the decade saw many lineup changes as the band continued to play gigs in Canada and the northeastern U.S.
New albums followed in 2002 (Lemon Tongue) and 2008 (Clifton Hill) and since 2007, Honeymoon Suite has toured Canada with the classic lineup (Dee, Grehan, Coburn, Lalonde, Betts…until Coburn left again two years later). This year, the band used PledgeMusic to successfully crowdfund a new EP that’s due out soon. The honeymoon may have been over long ago for Honeymoon Suite, but Dee and Grehan have managed to keep their musical marriage together for a good long time.